President Donald Trump’s son Barron joined his father aboard Air Force One on Sunday, as he moves into the White House with his family permanently. 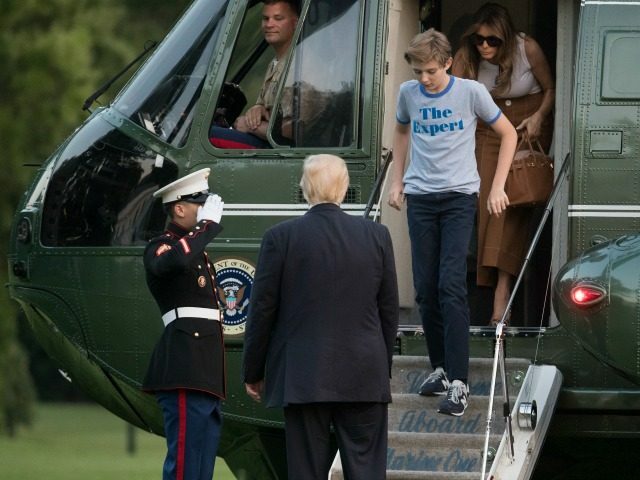 The youngest of the Trump children wore a T-shirt that read “The Expert” and played with a popular fidget spinner toy as he exited the plane on the tarmac at Andrews Air Force base. Both Barron Trump and Melania Trump stayed in New York City after the election until he finished school, but have now arrived in Washington to stay. The shirt is the subject of intense curiosity, as some Trump supporters referred to President Trump’s discussion of his son as having great abilities with computers. Barron Trump will attend St. Andrew’s Episcopal School in Maryland in the fall. “We are very excited for our son to attend St. Andrew’s Episcopal School. It is known for its diverse community and commitment to academic excellence,” said Melania Trump in a statement. Barron will be the first boy to live in the White House since 1963, when John F. Kennedy Jr. was only three years old.